The Academy for Arts Education developed – in cooperation with the University of Münster – the training concept DiKuBi (diversity-conscious arts education) that was funded by a 3-year-project of Germany’s BMBF (Federal Ministry of Education and Research) with the aim to link expert discourses on education and diversity by means of artistic-aesthetic experiential spaces. Methods and approaches of arts education allow a new resource-oriented perspective on the complex and therefore often strenuous (exhausting) subject of diversity. Existing intercultural training concepts, antibias and anti-discrimination methods focus mainly on the participants’ prejudices, which are mostly shortcoming-oriented. Most often one finds a theoretical-based attitude focusing on interculturality or transculturality. Multi-perspectivity of the arts, which do not differentiate between “right” or “wrong”, opens up various perspectives on these phenomena and offers positive, interesting and alternative approaches to diversity. In addition, arts education might be an instrument to approach diversity not solely on its cognitive level. In terms of individual development, it starts from each individual stance and provides scope for a playful approach, adapting one’s own positioning. Thus, the individual conduct in dealing with diversity is not limited but opens up future-related opportunities. The contribution focuses on the training concept of DiKuBi, its developing process, its practical contribution and its future chances for social cohesion. Heinrich, Bettina. 2017. Das Problem mit der Komplexität der Diversität und ihrer Differenzkategorien – eine kursorische Spurensuche mit Fokus auf Gender. Available at: https://www.kubi-online.de/artikel/problem-komplexitaet-diversitaet-ihrer-differenzkategorien-kursorische-spurensuche-fokus. Accessed 7 Dec 2017. ———. 2016b. Internationality in arts educational practice. An explorative empirical study. 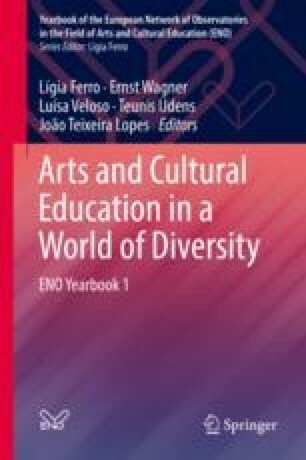 Available at: https://www.eno-net.eu/sites/default/files/keuchel_2015_internationality_in_arts_educational_practice_0.pdf. Accessed 21 Dec 2017.